TACLOBAN CITY – The Land Transportation Office in Eastern Visayas, starting March 1, 2013, will enforce the law that mandates drivers of public and private 4-wheeled vehicles to carry a pair of the prescribed standard early warning devices (EWD). This was disclosed by LTO Regional Director Edgardo Catarongan during the Information campaign conducted on February 14 at the LTO Regional Office. Dir. Catarongan said this was in line with nationwide directives, LOI 229 and Memorandum Circular No. VPT-2012-1609 dated December 13, 2011re: Revised Rules on the Implementation of the Early Warning Devices. Director Catarongan appealed to owners of four-wheeled vehicles to begin acquiring the prescribed yellow and red triangles that are to be used as early warning devices in order to ensure the safety of road users, especially when vehicles that encounter trouble were forced to park alongside the road. The LTO director noted that many vehicle owners do not have these objects in their driven units and it is a common site where owners or drivers of four-wheeled distressed vehicles parked alongside the road use other items such as broken tree branches as an early warning device. The prescribed triangular early warning device will have to meet LTO standards and should pass inspection by the said agency, Director Catarongan said. A sticker shall be attached to the back to show that it had been approved by the LTO. Catarongan underscored that under the Revised Rules on the Implementation of Early Warning Devices, the presentation of these accessories are not a requirement for motor vehicle registration but these should be presented during checkpoints upon demand by a deputized traffic law enforcer when apprehended for another offense. People who fail to carry and present the EWDs would be fined and penalized for non-compliance, Director Catarongan said, even as he clarified that tricycles and motorcycles are exempted from such law. Calbayog City, component city category regional champion. 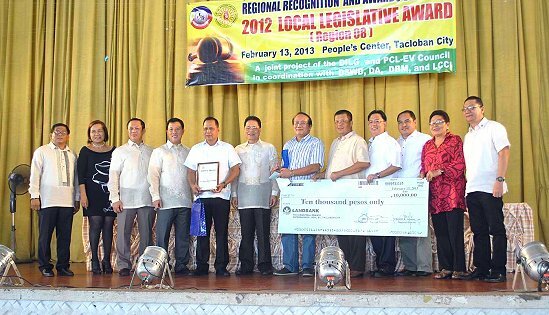 TACLOBAN CITY – The best performing municipal and city sanggunians in the Philippines stand to receive P1 Million pesos in projects each during the national Local Legislative Awards (LLA) ceremonies on March 7, 2013, revealed Atty. Alan Zulueta, national chairman of the Philippine Councilors League (PCL) during the Eastern Visayas regional LLA rites last February 13, 2013 in Tacloban City. The winners by category are: 1st to 3rd Class Municipality - Catarman, Northern Samar; 4th to 6th Class Municipality - Limasawa, Southern Leyte; HUC & Independent Component City - Ormoc City; Component City - Calbayog City. DILG Regional Director Pedro A. Noval Jr. meanwhile, exhorted the awardees and all sanggunians in Eastern Visayas to continue to innovate in order to address problems like poverty, crime and environmental degradation. “Being awardees you must strive to enhance the quality of your performance beyond administrative compliance, to uphold legislation that responds to the people’s needs and captures a viable vision of the LGU”, said Dir. Noval. Here is the complete list of regional awardees. For 1st to 3rd class municipality – Catarman, Northern Samar (champion); Hinunangan, Southern Leyte (1st runner-up); Naval, Biliran (2nd runner-up); Sta. Rita, Samar (3rd runner-up); Tanauan, Leyte (4th runner-up). For 4th to 6th class municipality – Limasawa, Southern Leyte (champion); Balangiga, Eastern Samar (1st runner-up); Babatngon, Leyte (2nd runner-up); Cabucgayan, Biliran (3rd runner-up); San Isidro, Northern Samar (4th runner-up); Motiong, Samar (5th runner-up). For HUC/ICC and Component City the champion was Ormoc City and Calbayog City respectively. The award seeks to highlight innovations and excellence in local legislation to inspire other sanggunians to perform better. Plaques were given to all regional awardees while regional champions received an additional P10,000 pesos cash from the PCL. It was learned further that only regional awardees which garnered an overall point score of at least 85% are eligible to become national nominees. Aside from the PCL which is the vice chair of the LLA Regional Awards Committee; the program owes its success to its partners, Department of Agriculture, Department of Social Welfare and Development, Department of the Environment and Natural Resources and the Leyte Chamber of Commerce and Industry which send representatives to the regional evaluation to validate the provincial nominees. The LLA was temporarily suspended in 2007 at the national level but has since been implemented continuously since 2008. The National LLA is now conferred every term of office of local officials. To allow for evaluations and validation to be conducted from the provincial, regional and national levels, the coverage period is from July 1, 2010 up to June 30, 2012. Meanwhile, based on the Memorandum of Agreement signed between PCL-EV and DILG-8 during the same ceremonies last February 13, the regional LLA search will be held yearly in order to further institutionalize the system of recognizing the best performing sanggunians in Eastern Visayas. League of Municipalities (LMP) Leyte President and Palo Mayor Remedios L. Petilla represented her son, Energy Secretary Carlos Jericho L. Petilla, who was invited to be the Guest Speaker. Leyte Governor Mimiette S. Bagulaya and PCL Regional President Wilson Uy likewise delivered their own short messages. CAMP KANGLEON, Palo, Leyte – Aside from gun ban violation, two riding-in-tandem suspects were arrested by the police for possessing illegal drugs and bladed weapon in a Comelec checkpoint in Tacloban City on Saturday evening. “The establishment of Comelec checkpoints are proven effective not only in the implementation of the gun ban but also in the campaign against all forms of illegal activities like dangerous drugs possession,” said Police Chief Superintendent Elmer Ragadio Soria, Regional Director of the Police Regional Office 8. Soria identified the suspects as Mario Macawile y Abolon, 43, married, of Brgy. 39, Serin District, Tacloban City and his backrider Oscar Macase y Sabenorio, 35, married of Brgy. Pawing, Palo, Leyte. The two were arrested by a police team led by Police Senior Inspector Noel Mondragon while manning a Comelec checkpoint along the National Highway in Brgy. Diit, Tacloban City at around 10:30 o’ clock Saturday night after confiscating a firearm, bladed weapon and several sachet of suspected methamphetamine hydrochloride or “shabu” from the suspects. “While our men were manning the checkpoint, the black Yamaha Mio motorcycle driven by Macawile was flagged down for inspection,” Soria informed. The vehicle was heading towards Tacloban City proper from north direction when the suspects obliged and stopped the motorcycle upon requesting to stop by the police team, the Regional Director said. When requested, Macawile failed to show his driver’s license but volunteered to present his Official Receipt and Certificate of Registration (OR-CR) which was then placed at the Utility Box. When the driver opened his U-box, police personnel manning the checkpoints saw in plain view a .38 caliber revolver marked Smith and Wesson with serial number 1023453 loaded with 4 live ammunitions and a bladed weapon locally known as “pisaw” measuring 5 ½” long. The police arrested the two suspects and a search incidental to lawful arrest conducted by the arresting officers resulted in the seizure of 10 heat-sealed plastic sachet of “shabu” and a multivitamins canister with suspected “shabu” residue in the right side pocket of the jacket being worn by Macawile. Suspects were immediately brought to Tacloban City Police Office for proper disposition as appropriate criminal charges are being prepared against them while the recovered drugs and firearm were brought to the Regional Crime Laboratory 8 for chemical examination. Soria disclosed that the suspects are the latest addition to the list of individuals nabbed by the police in the region in established Comelec checkpoints for gun ban violation. Earlier, policemen manning checkpoints were able to arrest a businessman in Calbayog City, a famer in Sta. Rita, Samar and a security guard in Capoocan, Leyte for gun ban violation since the start of the election period last January 13. On January 25, riding-in-tandem suspects were also nabbed in Ormoc City for illegal drugs possession while the police were implementing the Police Integrated Patrol System (PIPS). BRGY. MAGSAYSAY, Lope de Vega, Northern Samar – Another CPP/NPA camp has been seized by government forces in vicinity Km 11, Barangay Happy Valley, San Isidro, Northern Samar last February 9, 2013 at around 2:20 in the afternoon. Lieutenant Colonel Noel A Vestuir, 20IB’s Commanding Officer, in his report to 803rd Brigade Commander, Colonel Rolando Malinao, said that as the troops of Charlie Company, 20IB led by Sgt Orlando Onate while tracking down the reported NPA presence in the area as reported by the civilians, chanced upon a nipa hut in an isolated and secluded place which was later found out to be an NPA temporary camp. As the troops searched the area, they were able to recover one (1) jungle pack; one jungle hammock (duyan); one book entitled “Pag Aradman han mga Aktibista”; one (1) poncho; two (2) magazines for cal .45 pistol with eight (8) live ammunitions and two (2) empty shells; one (1) DSWD ID; one (1) COMELEC ID; one (1) sim card; one (1) memory card; one (1) USB; one (1) belt bag; and other personal belongings left by the fleeing communist terrorists. According to LTC Vestuir, the camp has one (1) Nipa hut, fifteen (15) makeshift bunkers that can accommodate more or less 15-20 communist terrorists, two (2) outposts and believed to be hastily destroyed and abandoned by the fleeing CTs before the arrival of the government troops. The camp was discovered after 20IB has launched sustained combat operations in the area of Victoria and San Isidro in response to the reported presence of communist terrorists in the area as tipped-in by the peace-loving residents. LTC Vestuir added, that the series of the discovery of NPA camps was a result of the continuing support of the people in the barangays. As can be recalled, two NPA camp were also seized by 20IB last week in Victoria and Catarman. According to LTC Vestuir, “the NPA camp was seized through the information given by the residents that enabled our troops to track the location that serve as a staging ground for their terroristic activities. As long as the people are with us, we will continue to find them, hunt them and drive them away from our peace-loving people so that peace shall reign in the barangays. The information provided by the populace is a clear indication that the enemy revolutionary organization has already alienated the people and the communities where they got their support through their forced extortion activities”. Vestuir also calls for the NPAs to surrender. “Considering that the people themselves no longer accept the NPAs in the barangays, it is high time that they shall already spare them of their extortion activities. With the series of discovery of their camps, it is clear that we have already narrowed the sphere of their influence and it would not be long for our troops to find them. If that would happen, we will not hesitate to use the full might and strength of our forces against them.” Vestuir concluded. TACLOBAN CITY – In line with its 62nd Anniversary celebration, the Department of Social Welfare and Development honoured three of its partners from the non-government organizations and the local government units for significantly providing successful social protection programs to marginalized and vulnerable sectors of the Region. This year’s awardees who were feted on February 6 at the Leyte Park Hotel in Tacloban City were South Pacific Integrated Agricultural Development Foundation Inc. (SPIADFI); Municipality of Javier, Leyte for the “Gawad Paglilingkod sa Sambayanan” (GAPAS) Award; and the Province of Leyte for the “Gawad sa Makabagong Teknolohiya” for introducing the biometric system for the Pantawid Pamilyang Pilipino Program. DSWD Regional Director Remia Tapispisan informed that the municipality of Javier, Leyte under the leadership of Mayor Leonardo Javier, also received the same recognition at the national level during the DSWD anniversary celebration, held last February 1, 2013 in Manila. The “Pagkilala sa Natatanging Kontribusyon Ko sa Bayan” (PaNaTa) awards is “our way of expressing gratitude and appreciation to our partners,” Director Tapispisan said. The “PaNaTa Ko Sa Bayan” Awards aims to recognize partners, stakeholders in appreciation with their unending support in the implementation of social protection programs at their own level. In the case of the Province of Leyte’s biometric system for the Pantawid Pamilyang Pilipino Program, the biometrics technology is now being replicated in the Autonomous Region of Muslim Mindanao, particularly in Maguindanao and Lanao del Sur, Ms. Joan Baclay, Information Officer for the Pantawid Pamilya in the Region, said. It may be recalled that no less than Social Welfare and Development Secretary Dinky Soliman witnessed the launching of the use of biometrics system for over-the-counter distribution of cash grants to Pantawid Pamilya beneficiaries at the Municipal Gymnasium of Matag-ob, Leyte in September of 2012. The biometrics system developed by three scholars of the Income Creating Opportunities Thru Technology Project (ICOTP-ICT) of the Provincial Government of Leyte and Department of Education, is an innovation being introduced by the DSWD and the local government of Leyte to validate beneficiaries of Pantawid Pamilya in the municipality. The system will hasten up transactions during over-the-counter release of cash grants which usually takes one day to pay out an average of 800 beneficiaries. With the biometrics, it took only 30 minutes to serve 212 beneficiaries to receive their cash grants. TACLOBAN CITY – The Provincial Board of Leyte has granted clearance to NorAsian Energy Ltd. to conduct drilling operations in an area covered by Service Contract 51 issued by the Department of Energy. Board Member Ryan Lawrence Tiu, chairman of the Sangguniang Panlalawigan’s Environment Committee, informed that the Leyte Provincial Board found no impediment to grant the clearance after going through the reports submitted by the Community Environment and Natural Resources Office and the Committee on Energy. Board Member Tiu said the company [NorAsian] together with the DoE has complied with the requirements of consultations and consent from all levels of the council as provided for by Sections 26 and 27 of the Local Government Code and Section 21 of the Environmental Code of the Province of Leyte. “Clearly, NorAsian Energy has endeavored to follow the proper procedures and complied with the necessary legal and documentary requirements. As such, there is no reason why the committee should not grant their request,” Tiu said. In compliance with the agreement made by the company and the legislative body last year, for it to regularly inform the Body on the update of the export exploration activity in the northwest part of Leyte, NorAsian made a presentation on January 22. The presentation showed that the 3D seismic survey conducted by NorAsian last year showed that there is sufficient deposit of oil in the area covered by SC 51 in the town of San Isidro, and this has to be verified through a drilling program. After the presentation, the company requested the august body for a resolution interposing no objection for it to drill the Duhat-2 prospect in mid-2013. NorAsian, a unit of Australian firm Otto Energy Ltd., has been contracted by the Department of Energy (DoE) to explore oil potentials within the 332,000 hectares of land over northwest Leyte embracing 20 barangays mostly covering the town of San Isidro but also includes the towns of Palompon, Tabango and Calubian. According to Otto Energy, drilling could cost $2.5 million to $3 million. Based on DoE’s projection, NorAsian could extract a minimum of two million to 18 million barrels of oil from the project site. The island of Leyte which is situated in the eastern Visayan region of the Philippines has been known for more than a century to be the site of numerous fresh natural oil seeps and the Balite tar sands which have been mined in the past for bitumen. The presence of natural seeps and surface indications of large anticlinal features with the potential for petroleum reservoirs are strong positive indicators of the prospect of a basin largely untested by modern drilling. According to the DOE, the first and only deep well in the basin, Calubian-1 (2500m), drilled on Leyte, was positioned on surface observations in 1957 and indicated the presence of both oil in side wall cores and Miocene age reservoir sands. The recently acquired seismic has proven that this well was drilled off structure, an invalid test, and being the only deep well in the region confirms that the potential of the entire region has yet to be effectively tested. In 2012, Otto Energy, on behalf of its Joint Venture partners, acquired 150km of new high quality 2D seismic data over the San Isidro anticline. This anticline has been identified from surface information for some time but was previously poorly understood and only defined by a sparse 50km and poor quality seismic. The new data has confirmed a large target, which will be tested by the Duhat-2 well in mid- 2013. CAMP SEC. KANGLEON, Palo, Leyte – An employee of the Commission on Elections was arrested by the police on Wednesday night for violation of the gun ban that is being imposed by his own agency. “We have to enforce the law without favor even if the violator is connected with the office mandating us to implement such rule,” said Police Chief Superintendent Elmer Ragadio Soria, Regional Director of Police Regional Office 8 (PRO8). The Philippine National Police is one of the deputized agencies by the poll body as a partner in ensuring secure and fair elections per Comelec Resolution No. 9571. Soria identified the suspect as Pedro Sugalan y Orosco alias Peter, 46, married, utility worker of the Comelec Samar Provincial Office and a native of Brgy Paypayon, Oras, Eastern Samar. Reports reaching PRO8 disclosed that at around 11:10 o’clock Wednesday evening, an information was relayed to Catbalogan City Police Station on alleged gun burst heard at the vicinity of COMELEC Samar Provincial Office located at Old Justice Building along Curry Ave., Brgy. 7, Catbalogan City. A police team was immediately dispatched to the area to validate the veracity of the report that resulted to the arrest of Sugalan and the confiscation of one caliber .25 pistol marked Phoenix Arms Ontario model HP25 bearing serial number 4163916 with firearm license number 117362212282750 with one magazine loaded with 6 live ammunition; one inside holster and 2 fired cartridge of .25 caliber. Suspect was immediately brought to Catbalogan City Police Station for proper disposition and subsequently brought to Samar Provincial Hospital for medical examination and Samar Provincial Crime Laboratory Office for paraffin test while the confiscated firearm and ammunition was subjected for ballistic examination and gun residue test. The top police official further informed that a case for violation of section 32 of RA 7166 in relation to COMELEC Resolution Number 9561-A was already filed against Sugalan at the Office of the Provincial Prosecutor in Catbalogan City docketed under NPS-VIII-08-INQ-13B-00361 on February 7, 2013. Suspect was immediately released after paying the recommended bailbond in the amount of P12,000.00. Under Section 32 of RA 7166, during the election period, no person shall bear, carry or transport firearms or other deadly weapons in public places, including any building, street, park, private vehicle or public conveyance, even if licensed to possess or carry the same, unless authorized in writing by the Commission on Elections. The issuance of firearms licenses shall be suspended during the election period. The law further states that only regular members or officers of the Philippine National Police, the Armed Forces of the Philippines and other enforcement agencies of the Government who are duly deputized in writing by the Commission for election duty may be authorized to carry and possess firearms during the election period. Provided, that, when in the possession of firearms, the deputized law enforcement officer must be in full uniform showing clearly and legibly his name, rank and serial number which shall remain visible at all times; and in the actual performance of his election duty in the specific area designated by the Commission.